What if you had Superhero powers like Spider-Man, Batman and Superman? You could have an amazing gift to do the unexpected and save the day. Sure, you’ve been tracking calls from your dealership’s website for years. Your store may even be running an expensive pay-per-click campaign that is bringing well-qualified leads. That is what the average “Clark Kent” is managing for his dealership and probably getting praise for being on the cutting edge of internet marketing. Are you ready to be a Superhero? Get ready to switch from Clark Kent to Superman and unveil that special uniform under your suit. 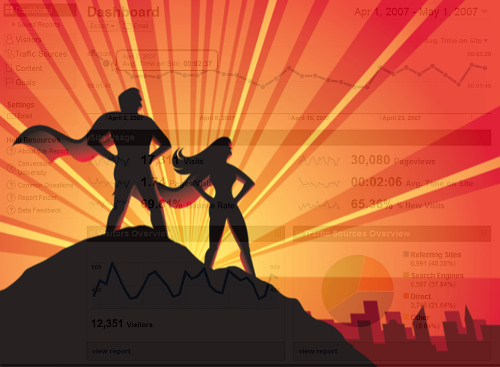 Extract the most out of your dealer website tracking with the following Four Superhero Powers. Power Number One: Have x-ray vision. Find out which keywords are bringing you phone calls. Is it the term “Honda” or “Honda oil change coupon” that is generating leads? There are ways to track these calls back to the individual keyword without constantly monitoring the program, adding phone numbers and investing too much of your marketing budget. Proxy sites can create a bit of a mess for your SEO, so steer clear of this method. By using x-ray vision, you can tell your SEM to shift your ppc budget those terms that are actually selling cars. Power Number Two: Try leaping tall buildings in a single bound. List one number on your dealership’s website with a greeting to connect callers with the right department. If there are 3-4 numbers listed, often times the caller will dial the first number listed anyway. Your customers will have a better experience, and the sales team will be happy when talking with leads that want to buy a car (not make a service appointment). Look at trend analytics of your inbound calls. What time of day or day-of-the-week are you getting an influx of leads? Are you staffed appropriately at these times? Features like scheduling and round robin will help the team to not miss an opportunity. More than likely, there is no additional cost to set this up. Power Number Three: Use accelerated healing (think Wolverine). Don’t let those bad sales calls wound you or your sales team. Listen to call recordings and save a potential customer from calling your competitor, then play back the call in a training session. Everyone will learn quickly what they should be saying and how to close a sale faster. Power Number Four: You’ve become immortal. Import calls from your website into your lead management tool, your CRM. This is your lifeblood and the place where you spend all of your time anyway. You shouldn’t have to log into another system to look at calls. Who has time for this? You are there to sell cars, not remember passwords and instructions on how to run a call report. Integrating your call tracking with your CRM will make your life easier. You cannot deny the powerful gifts that you have been given to effectively manage your website and call tracking system. Be the Superhero that you were meant to be and start today with these Four Superhero powers. If you aren’t sure how to use these powers or forget what they are all about, contact your call tracking provider to help you get the most out of the service. Their job is to support the Superhero! Jennifer, you're my hero! Great article. I use Century Interactive and love your product. Leah my sales rep is a Super Hero too. You guys rock! Jennifer – you're absolutely right. One number is definitely the way to go with things these days. Some dealers want to hang onto a phone number they're "known by", but with cell phones, Google, and syncing address books how many phone numbers does one actually remember these days (much less, their car dealer's number)? With the death of rotary phones does anyone care that they have to dial 10 digits instead of 7? I say 8xx number your site for tracking purposes – you're not going to upset any customers. I'm impressed with your comic book knowledge!